A town in South Lanarkshire, Hamilton lies to the west of Motherwell and the M74 motorway, 11 miles (17.5 km) southeast of Glasgow, near the junction of the Avon Water with the River Clyde. Chartered as a burgh of barony in the 15th century, Hamilton developed around the site of a college established by Lord Hamilton in 1451. The fortunes of the town were closely linked to the Hamilton family, who became the Earls of Arran, Dukes of Chatelherault and eventually Dukes of Hamilton. They owned both the 13th-century Hamilton Castle and the nearby Cadzow Castle, another 13th-century fortress built originally for King Alexander II. The former was rebuilt as the grand edifice of Hamilton Palace in 1695, but was eventually demolished in the 1920s. The town expanded in the 18th and 19th centuries in association with the manufacture of textiles, mining and engineering industries. 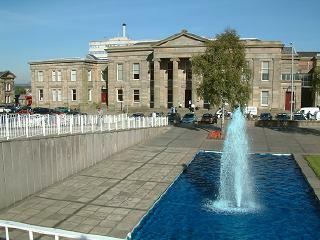 Notable buildings include the neoclassical Town House which was the headquarters of Hamilton District Council (1975-96), the old Parish Church designed by William Adam in 1732, which has a Celtic cross in the churchyard. Close to the site of the former palace lies Mote Hill, an ancient site of justice and the Hamilton Mausoleum, built 1842-58 for the 10th Duke of Hamilton as a chapel and tomb. Notables born in Hamilton include physiologist William Cullen (1710-90), churchman William Cunningham (1805-61), actor Nicol Williamson (b.1938) and Mark McManus (1935-94), McManus's half-brother rock musician Brian Connolly (1945-97) and politician Margo MacDonald (1943 - 2014). Above the town is Chatelherault, the former hunting lodge of the Dukes of Hamilton, also built by William Adam, which lies within Chatelherault Country Park. Several streams flow through the town including Meikle Burn, Cadzow Burn, Wellshaw Burn, Park Burn and Earnock Burn. There are railway stations at West and Central, and Hamilton has several business parks in addition to the Hamilton Park Race Course, the Hamilton Water Palace leisure centre (1995), two golf courses and the Low Parks Museum, which incorporates the Regimental Museum of the Cameronians. To the east, beyond the River Clyde, is Strathclyde Country Park.